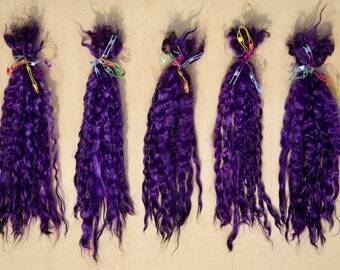 Royal Purple Curly Doll Hair / 0.2 oz / Mohair / Cruelty Free / Hand Dyed / Pruple / Silky And Crimpy! 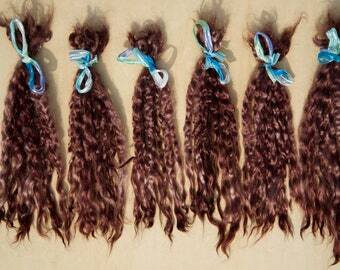 Mousy Brown Ombre Curly Doll Hair / 0.2 oz / Mohair / Cruelty Free / Hand Dyed / Pastel Brown Mauve-Brown Ombre / Silky and Crimpy! Mother Of Pearl Pink Curly Doll Hair / 0.2 oz / Mohair / Cruelty Free / Hand Dyed / Pink Lilac Fuchsia / Silky And Crimpy! 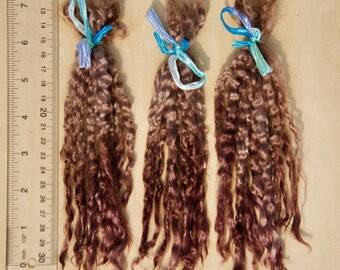 Mauve Brown Curly Doll Hair / 0.2 oz / Mohair / Cruelty Free / Hand Dyed / Mauve Brown / Silky and Crimpy! Wonderful colors of Mohair locks. Exactly as described and oh so soft, nice staple length, clean, no matting whatsoever. Spins beautifully on its own but perfect blended with some fine wool. Also it’s a LOT of fiber and will keep me busy for a while. With angora bunny a little goes along way and shows it presence in very small percentages in your yarn. Highly recommended! Angora Goat kids enjoying a beautiful day on our farm in the mountains. Allen shows the Haitian agronomy students how to check for anemia through gum color in comparison to a color chart. We bonded quickly with the group of agronomy students and goat farmers in northern Haiti. The passion of the farmers and students in Haiti was infectious. Here is a formal training we did in a classroom. Beautiful, healthy locks growing on one of our treasured goats. Do you know where your fiber comes from? Every mohair fleece we sell on our Etsy shop comes from our farm and our goats. We are small farmers who lovingly raise goats from birth, nurture them with the best foods, and offer them open space on the mountain to roam, play, relax, and eat wild grasses and plants. We shear, clean, wash, dye, package, and ship our fleeces by hand on our farm. The mohair you buy from Eureka! Mohair Farm comes from Eureka! Mohair Farm, and your purchases allow us to continue doing what we do best. And don't just take our word for quality. For over 20 years, Eureka! Mohair Farm has won more national awards for Colored Angora Goats than any farm in the world. We are proud of our goats, and proud of our progress! Here at Eureka! Mohair Farm we believe in the Quality and Care of our fiber and our goats. In an effort to maintain our high standards and to continue improvement of our fiber, we show competitively with other farms, allowing an informed platform for ideas and methods to be shared amongst the top professionals in our field. The result of contemporary livestock competitions has driven each of us to continue producing healthy, happy Angora Goats who grow fine, soft kid-grade mohair for a LIFETIME! We support a NO-KILL breeding strategy and all of our products are 100% CRUELTY FREE. Producing Silky, Smooth, Strong fibers that are capable of elevating and inspiring unique creative projects by artists like yourself is our number one priority! Our love for goats has taken us around the country, and more recently to Haiti where we volunteer with a USAID Farmer-to-Farmer project with the Partners of the Americas to teach farmers how to better raise goats to feed their families. While we do not eat our goats, we realize that goat meat is one of the most recognized sources of protein in the world, and is a vital staple in the diets of some of the world's most impoverished people. Goats are small, relatively easy to manage, and can thrive on a forage-based diet. These characteristics make goats a perfect farm animal in the developing world, especially for women and children. We spent Christmas 2014 through New Year 2015 holidays volunteering in northern Haiti near the city of Cap-Haitien. It was an unbelievable experience where we made lifelong bonds and cemented aspirations to return to Haiti again to offer our support and experience as goat farmers. It is our sincere hope, most of all, that our presence makes some impact on the farmers we worked with firsthand. White Angora Goats have been coveted for 2 millennia for their lustrous, strong, silky mohair fleeces. Colored Angora Goats, on the other hand, are a relatively new breed of livestock. The breed got their start in the 90s when hand spinners and artists in the Northwest United States sought natural colored mohair for their art. Turning to the Navajo reservations for natural color and Texas for tried-and-true white Angora genetics, the women created a breed we now see throughout North America. We got our start in the late 90s and Randy was an early member of the Colored Angora Goat Breeders Association, founded in 1999. It has been a challenge, often a struggle, and always an ultimate love being a part of the breed's development. We are proud of our goats, and the vast improvements our peers have made nationwide. Since our early days as Colored Angora Goat breeders, we have offered mohair to hand spinners and doll hair artists. When we got our start, the natural colored mohair was not as good in quality, was often not uniform, coarser in texture, and did not have the appeal in length that we see today. In those days, we were satisfied if kid fleeces weighed 2 pounds. Today, we are raising Colored Angora Goats that are stronger and growing long, uniform, fine, lustrous, and curly fleeces from their nose to tails which can weigh two to three times as much. While we measure the improvements, we are still determined to do better! Eureka! Mohair Farm joined Etsy in 2009 and has since been honored to send natural colored and white mohair around the world to 15 countries. The mohair you purchase from our shop was raised with compassion and experience on our small farm in the Sierra-Nevada Mountains of Central California. Allen has had Angora Goats since he was 7. Today he operates the farm with Randy and manages the fleeces. He enjoys volunteering in Haiti with USAID Farmer-to-Farmer projects to promote sustainability through agricultural with goats and rabbits. Longtime rabbit breeder and judge, Randy got his first Angora Goats in the 90s and was an early member of the Colored Angora Goat Breeders Association (CAGBA). He's served two CAGBA board positions and loves being a part of the breed's development. Betty Chu has raised and shown English Angora rabbits for more than 30 years. She is hailed by many around the world as a champion at rabbit shows for her incredible, soft, and unbeatable English Angora rabbits. Betty has been featured on TV game and talk shows, news programs, and social media. Lucien Dante is an incredibly talented multimedia artist who has had a deep passion for fiber since he was a toddler. He makes breathtaking felted sculptures sometimes standing 14 feet tall! It is with a joyful, grateful heart that he is now working for Eureka! Mohair Farm on our creative products! Welcome to Eureka! MOHAIR Farm! Located in the Sierra-Nevada Mountains of California, our farm specializes in breeding and showing nationally competitive natural colored and white Angora Goats. Our focus is maintaining a herd that stands out in quality. We've traveled as far as West Virginia to show, and many states in between. Because so much of our energy goes into producing a superior show animal, we consequently have Angora Goats that produce excellent quality mohair. Most of our fleeces that we sell come from our show string; show goats are kept in impeccable condition, and thus our fleeces are very clean of vegetable matter (VM). Each year, we select our favorite fleeces for show. After the show season, we offer for sale our fleeces. Many of the fleeces in our Etsy shop are some of our top show fleeces; we try to highlight some of these winning mohair fleeces within our shop for you to select from. Our goats are kept in a very clean, safe, and spacious environment. Taking the best care of our goats is always our number one goal. Providing our customers with superior mohair for doll hair and fiber art is our pleasure. 2017 California State Fair "Farm Marketing Award"
2018 California State Fair "Most Educational Farm Display"
We promise to make every effort possible to ensure the fleece you envision is the fleece that you receive from our farm. Our mohair comes from our line of competitive show Angora Goats. We put a lot of time and money into maintaining our animals, and our fleeces are a testament to this in their cleanliness and quality. Mohair is our passion, and we understand the needs of the fiber artist. If a fleece has medium to heavy VM, it will be noted and discounted in its description. If you receive a fleece that you are not satisfied with, we will refund the purchase price or send you a replacement. We accept paypal for payment of our fiber. Each fleece will ship USPS parcel post. If the cost of Priority mailing is not significantly more than the parcel post cost, Priority mailing will be used. Shipping prices are close estimates of the actual costs. If the actual cost of shipping is much less than paid for by the customer, a refund will be certainly offered. Most mohair will be shipped in recycled paper bags. We are an environmentally friendly farm and try to be as "green" as possible. YES, we will ship internationally! It is an honor to ship fleeces outside of the United States. Eureka! MOHAIR Farm is home to 100 Angora Goats. Our Etsy shop is just a small selection of our mohair. If you have a special request in color, grade, staple length, character... please feel free to contact us; we likely have exactly what you're looking for in our studio of fleeces, and we'll be more than happy to find it for your special project!